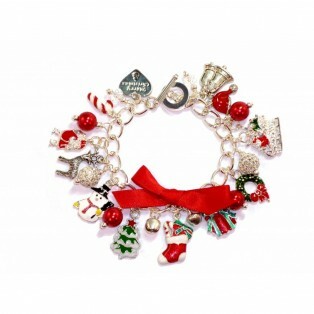 A standard adult charm bracelet with silver tone charms that have been coated with enamel. Charms include Santa, Snowman, Christmas Tree, Christmas Stocking gifts, Christmas Gift charm, Holly Wreath, Candy Cane, Santa Hat and a Snowflake. I have also added some Jingle Bells and red glass pearls.